If you are looking for heart, warmth and wit, you will find them in Miss Hazeltine's Home for Shy and Fearful Cats. A charming story, filled with warmth and gentle humor, is sure to reward any family read aloud. The most timid of all is Crumb. He cowers in a corner. Miss Hazeltine doesn’t mind. But when she gets in trouble and only Crumb knows where she is, will he find his inner courage and lead a daring rescue? 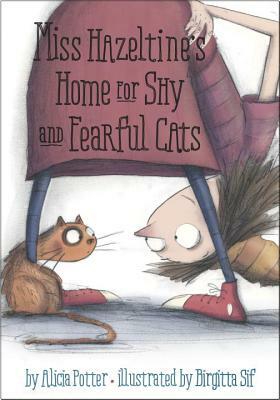 Filled with adorable illustrations and ideal for fans of Disappearing Desmond and The Invisible Boy, Miss Hazeltine’s Home for Shy and Fearful Cats is a story that’s perfect for shy and fearful children as it both helps them face scary situations and accepts them just as they are. Alicia Potter is the author of several picture books, including Mrs. Harkness and the Panda, which was a Cybils Award winner and was named an NCSS-CBC Notable Social Studies Trade Book for Young People. She lives in Boston, where she is a freelance writer and children’s book reviewer. As a former animal shelter “foster mom,” she has coaxed many a kitten out from under the bed. Birgitta Sif was born in Reykjavik, Iceland, and lived in and around Scandinavia and the United States while growing up. She is the author and illustrator of Oliver, a finalist for the prestigious Kate Greenaway Medal for picture books in the United Kingdom. She currently lives in Sweden with her family.